I apologize for not posting about this earlier. This is really cool, and relatively unusual. Go check em out! Are you seeing owls in Whatcom or Skagit Counties? Let me know. Heavy fog again in spots on the two lower sections. In clear weather these numbers might have been higher. Do you like to see bald eagles? Well, you are in luck because there are plenty in the area right now. Traveling up the Skagit River valley on Highway 20 on Monday December 26, I saw 39 eagles at the big bend in the river near milepost 101. That was with the naked eye, out the car window, while the car was moving! (My husband was driving, don’t worry) We did not have time to stop and look, since we were meeting friends to float the upper Skagit. The rain held off, it was a beautiful trip, and we saw probably about 40 birds between Goodell and Copper Creek. 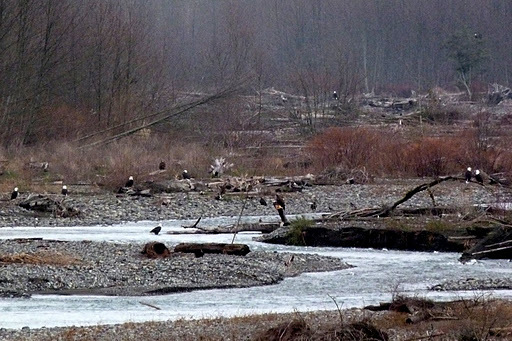 Don saw over 100 eagles on the Nooksack – not bad! Look at how low all the birds are in this picture! The chum must be plentiful right now. It will be interesting to see where the eagles end up after the heavy rains which are forecast this week begin moving the fish carcasses around. Happy solstice! 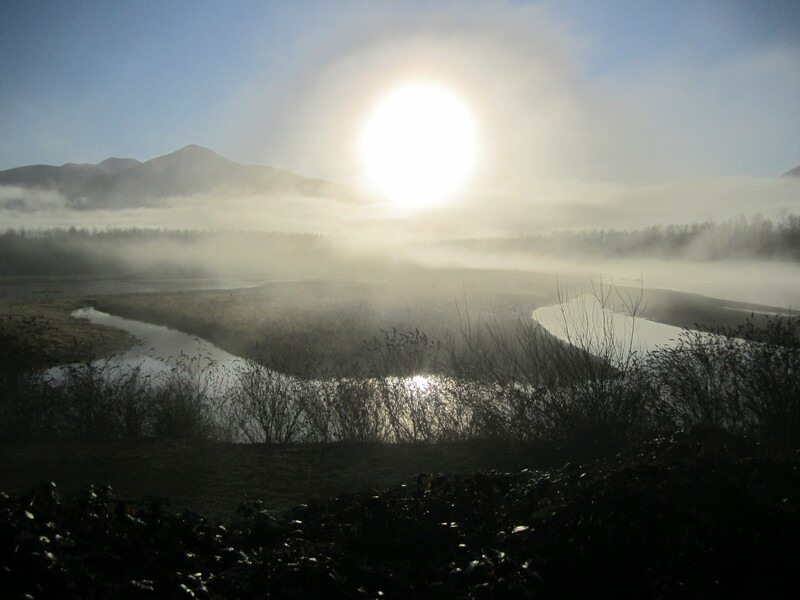 Beautiful morning, but difficult conditions for seeing eagles. The morning fog may have contributed to the lower numbers compared to December 15. It was great to see everyone over the weekend, and I enjoyed the presentations very much. I’m pounding out the schedules now – look for them to be posted here shortly. We need more help January 1, contact me if you are interested.